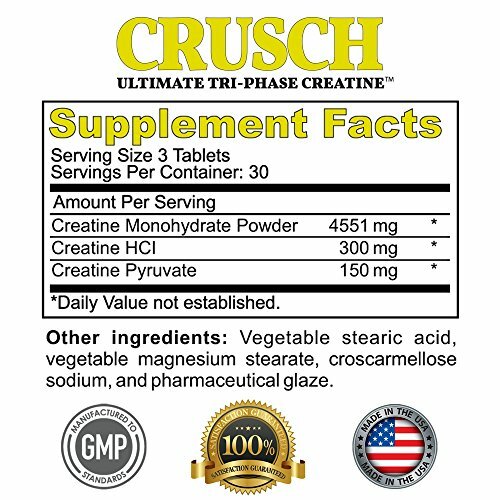 Crusch ultimate tri-phase creatine |Lowest Price Today w/ Free Shipping! Creatine is one of, if not the most popular supplement in the world of fitness and bodybuilding. Athletes all across the globe use it because of the amazing effect it has on the human body. Its efficiency is visible from all the positive feedback it is getting from the people who use it. Creatine is so popular and appreciated for a reason. It provides many great benefits such as enhanced strength, increased muscle mass, improved athletic performance, and it also promotes bigger gains. Today we are going to review Crusch by BELDT Labs. A product that seems usual at first, but hides few great features that become visible when you take a look at its ingredients. Folks from BELDT Labs claim it is designed to boost nitric oxide load, fight fatigue and provide all the above-mentioned creatine benefits. Continue reading to find out is it any good, and can it actually make all this great stuff for you. CRUSCH ingredients – What do we know? It is one of the most famous and most researched forms of creatine currently on the market. Various studies are showing it truly is one of the most beneficial low-risk supplements for athletes. Improved performance, enhanced strength, and positive changes in lean body mass are just the top of the iceberg. Type of creatine that doesn’t need a loading phase and is capable of delivering great results in relatively small dosages. One of its main roles is the promotion of muscular energy, which allows you to avoid lactic acid build-up and perform at a higher level. It is a creatine bound with pyruvic acid. Although it isn’t as effective on its own as the previous two forms of creatine, it is still as important. Pyruvate is believed to increase uptake and utilization of glucose from the blood. It is a great addition to the formula for an even better efficiency of the product. Crusch formula looks great, and it is pretty clear people from BELDT Labs put some thoughts and care into the design. It is not the first time we are seeing something like this from this brand and hopefully, you guys will start appreciating their effort as we do. It is capable providing awesome results on its own, and if you want to experience even greater gains feel free to stack it with something else. CRUSCH Side effects – should you be worried? What do other users have to say about CRUSCH? Although not everyone was left happy with the results, most of the reviews online were having nothing but nice words for the product. Can this creatine really make a difference? I’m sure you’re all familiar with the benefits of creatine so there’s really no need for me to repeat the same boring stuff all over again. That’s why I’m not going to explain to you what or how creatine does what it does. Instead, I’ll tell you my own experience and try to give you a proper answer to the question above – Can this creatine really make a difference? First off, I’d like to point out that I haven’t used creatine for quite some time. Believe it or not, CRUSCH was my first creatine mixture in 2017. When the opportunity to test it arrived I wasn’t exactly all for it. But now… let’s just say I’m glad I did! For those of you who are expecting miracles in terms of raw strength and extremely improved workout endurance… CRUSCH most likely won’t do that. But still, what it will do is allow you a few more reps and give you a massive self-confidence boost. That’s what happened to me! About 1 week in I started feeling massive improvements. My body was bulking up on muscle and my reps were rocketing sky-high. If that’s something you’d also want to experience, then CRUSCH is the way to go! After taking everything stated above into consideration, here’s what I have to say about this creatine supplement! If you are trying to take your physique to another level with a great addition to your diet creatine seems like a reasonable choice. It has been on the market for a while and has left a mark like only a few other supplements managed to. Crusch is a three form creatine allowing you to experience maximum results. BELDT Labs designed this pill to provide improved strength, endurance, lean muscle gains, and a boost in energy. Despite the few negative reviews Crusch still looks like a great option for anyone trying to find a good creatine supplement. How much does CRUSCH cost? CRUSCH goes somewhere around the $40 mark. Considering the fact we’re talking about a high quality creatine mixture that has a lot of satisfied customers, it is quite obvious that it works.